What a daunting task it would be to write a list like this, but fortunately for us, Norton (of the Norton Anthologies) asked 125 of the greatest living writers to select their top 10, and then (using statistics) produced a final list of the ten greatest books ever written. I certainly agree with the majority of the selections. This is a list of the top 10 books of all time – needless to say, if you have not read these books, you probably should. 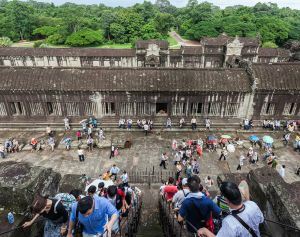 Tourists at Angkor (image from Poco a poco). I’ve always been a proponent of writing in books, even dog-earing pages on occasion. To me, that’s just showing the book a little love. When I’m finished with a novel, I want the novel to look like I’ve read it. And what better way to do that than writing my thoughts in the margins? Mortimer Adler wrote a book appropriately called How to Read a Book. Time recently published an excerpt in which Adler explains why you shouldn’t be ashamed to write in your books.